Most of Uganda's meat and milk is produced by nomadic herders who utilize a large portion of the country's interior land to raise their cattle. This type of communal herding has been part of Ugandan society for centuries and relies on regular annual rainfall patterns to rehydrate watering holes and grasslands for grazing. This case study focuses primarily on water scarcity and how it's affecting the Ankole cattle corridor. More specifically how rainfall patterns are changing as a result of climate change causing drought and thus causing herders to compete for land or travel further in order to maintain their herds. This branching out is causing herders to intrude on the lands of farmers and further contributing to desertification. Further perpetuating conflict and environmental degradation is a huge population boom and economic shifts. Disputes over land are becoming all too common as development, climate change, and unreliable legal resolutions bring about more change. The herders in the Ankole cattle corridor in central Uganda make up about 17% of agricultural GDP, and almost 8% of GDP as a whole (Case Studies...). Water scarcity in the region resulting in droughts is drying up watering holes and causing grasslands to die or disappear. This is contributing to overgrazing and causing herders to travel further to find land to feed their cattle. Furthermore, water scarcity and the lack of food security have contributed to many social and cultural conflicts as well. climatic conditions" (Climate Change and Conflict in Uganda...). Pastoralism is very closely related with culture because certain tribes and ethnic groups in Uganda consider cattle farming part of their heritage (Climate Change and Conflict in Uganda...). With drought and the scarcity of arable pastures comes conflict between these tribes and groups over watering holes and the like. As resources dwindle, competition has become more fierce as people try to maintain their livelihoods both economically and culturally. Climate change is also affecting farmers as their fields and water supplies dry up and die. They too rely on rainy seasons to know when to plant and when to harvest. As these seasons become more erratic they often plant when the rains come; many times their crops die because rains disappear again. With one of the highest population growth rates in the world and already disturbing levels of poverty and malnutrition, climate change is further threatening food security. Another important thing to note is that there are no individual property rights like here in the United States; it's estimated that about 90% of land ownership is not legally recognized (Deigninger and Castagnini 2004). As Uganda develops, more and more of these grasslands are being fenced off or turning into fields for farmers. As herders travel further to maintain their cattle, they often intrude on crops and watering holes to which farmers have layed claim. This is the main cause of conflict between herders and farmers. Most of these actors have little confidence in the legal system in Uganda to resolve their issues and often resort to violence or payment in some form (Climate Change and Conflict in Uganda...). 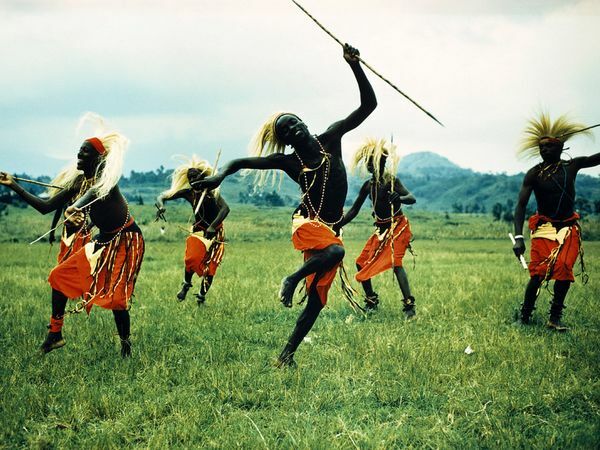 The herders of the Ankole Corridor are nomadic cattle farmers in the central grasslands of Uganda. 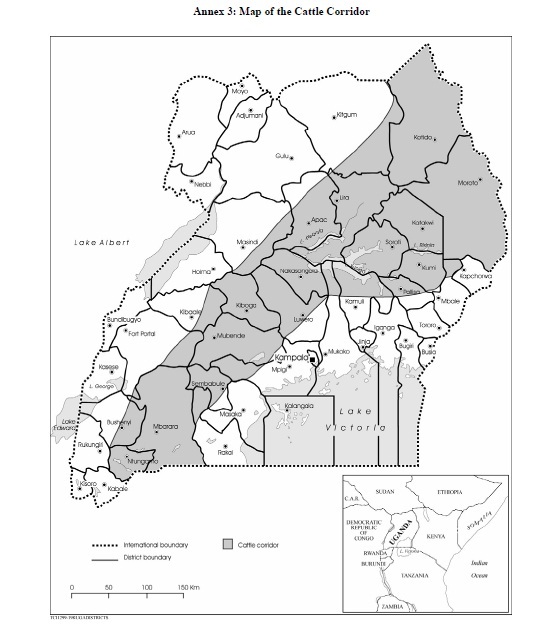 The corridor goes through 29 of Uganda's districts and spans the entire length of the country southwest to northeast all the way into neighboring Tanzania (Case Studies...). Undoubtedly, the herders in the Ankole corridor are the main actors. They're also among the poorest in Uganda, with high levels of infant mortality, low levels of literacy, and low levels of political participation (Climate Change and Conflict in Uganda...). Many of them distrust the government and the legal system. There is also a stigma towards pastoralists; the average Ugandan views them as backward, completing a task that is expected to inevitably change to something more sustainable like regular fenced ranching (Climate Change and Conflict in Uganda...). It's important to note that climate change is not the only factor affecting herders but rather a factor that is contributing to the others that include: poor public perception, development and landscape conversion resulting in less open land, declining traditional pastoralism, as well as land rights. Last, herders make up a variety of different tribes and ethnic groups which sometimes results in conflict between herders. Farmers are on the other side of the conflict. Currently the vast majority of agriculture relies on rainfall displaying the sensitivity of Ugandan agriculture. Agriculture makes up 40% of total GDP and makes up about 80% of total employment (Livestock Development Project 2004). The number of farmers is likely to increase as the population grows and more development occurs. Furthermore, the carrying capacity of farmers in Uganda is estimated much higher than current levels with the use of proper irrigation systems. The government plays a large role in the conflict between farmers and herders, often times siding with farmers and creating programs to increase agriculture and maintain their rights. In recent times, the government has done considerably well in reducing poverty levels by expanding the economy all the while increasing the production of food by implementing more farming (Climate Change and Conflict in Uganda...). Another interesting fact about the government is the widespread public distrust of the legal system and its ability to properly maintain order and settle land disputes (Suijt 2009). In Uganda, land rights are not as clearly defined as they are in Western countries. Because of previously low density population levels, land rights were more loosely regulated (Deigninger and Castagnini 2004). Today, elders who once knew the boundaries are dead and farmers and herders who have used lands for decades are now "embroiled" in land disputes with royals who claim to own large tracts of the Ankole (Deigninger and Castagnini 2004). The need for proper land ownership and registry regulations has never been greater and NGOs like USAID and the World Bank have stepped in to try to implement more westernized land ownership policies to reduce conflict and maintain social stability in the face of a burgeoning population (Deigninger and Castagnini 2004). With the advent of climate change and more erratic rainfall, they also work towards creating irrigation infrastructure and the use of climate change resistant agriculture practices that include: drought resistant crops, education about proper growing periods, as well as restructuring of the economy to reduce the negative impact of climate change (Deigninger and Castagnini 2004). As of 2009, there's been a 0.3ºC temperature increase in the Ankole corridor (Bifubyeka 2009). The temperature is expected to increase by about 2ºC within the next few decades (Impact of Temperature...). Although some might argue that the desertification of the Ankole corridor is due to overgrazing and environmental degradation from things like mineral and oil exploitation, the evidence that climate change is apparent. The increase in greenhouse gases has caused surface ocean temperatures to rise, particularly in the central and eastern equatorial regions of the Pacific and Indian oceans (Bifubyeka 2009). Along these areas prevailing winds usually bringing rain to Uganda have heated up (Bifubyeka 2009). This increase in temperature in the winds has caused erratic and decreased rainfall in the Ankole corridor. Below is a diagram depicting the direction of the prevailing winds from the Pacific and Indian oceans. 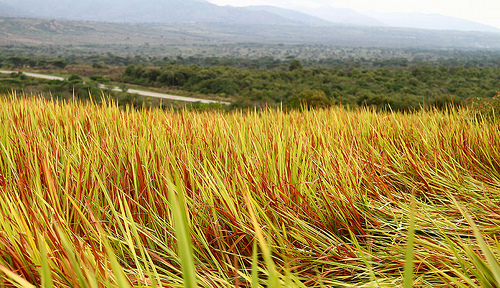 Most of Uganda is flat grassland on a plateau. One of the main causes of this change is the lack of mountainous area or hills to capture the moisture in the winds and deposit rain (Bifubyeka 2009). Also, forests in Uganda are scarce both because of the natural environmental conditions and because of development and industry. Forests sometimes create microclimates that favor rainfall. One of the most striking pieces of evidence validating climate change in the area is increased humidity and the increased presence of morning dew because of increased temperatures (Corner 2011). Furthermore, the amount of "extreme weather deaths" and the length of droughts is on the rise (Corner 2011). According to the International Water Management Insititute, Uganda is already experiencing "economic water scarcity" meaning that many of its cash crops and agricultural exports are now being threatened due to the lack of water (International Water Management...). One example that is being affected by the rise in temperature and the subsequent decrease in rainfall and scarcity of water is robusta coffee. It’s important to note that robusta coffee is already adapted to grow in dryer climates and that the growing conditions for robusta coffee are closely linked to the grasslands that feed Ugandan cattle and also allow other crops to grow. Below are diagrams that display Uganda's current state of economic scarcity and the reduction of robusta coffee that is likely to happen within the next few decades. The Ankole Corridor, and about 75% of Eastern Africa, is classified as semi-arid grasslands (Reid, Serneels, Nyabenge, & Hanson). This sort of area is prone to periodic droughts and therefore presents some pastoral and agricultural risk. The mean temperature varies by altitute but remains pretty constant year round somewhere in the 70s or 80s Fahrenheit (Uganda-Climate...). Annual rainfall varies by region but is usually between 30-40 inches (Uganda-Climate...). Conflict occurs primarily when herders in the Ankole Corridor travel onto farmers' land or land that has been fenced for development. Conflict also occurs sometimes when two differing tribes or ethnic groups compete for the same land. This is rarely resolved in the court system because of the inefficiencies and distrust of taking the legal route. For this reason, both the act and harm sites are the same: the Ankole cattle corridor. For the most part conflict between farmers and herders results in negotiations and many times some sort of payment is given to the farmer for the temporary use of their land (Climate Change and Conflict in Uganda...). There have been a few incidences, mostly between herders of different tribes or ethnic groups, where conflict has turned violent but this is not usual. Also, the government is hardly ever involved in conflict resolution. Conflict over land is becoming increasingly prevalent as erratic rain patterns and droughts become more common. Although the pastoral lifestyle is beginning to decline, conflict is still on the rise. Aside from a few isolated incidences, conflict rarely results in fatalities. The government has even started disarmament programs targeted at herders and tribal groups who have acquired weapons with the intention of using them for defensive purposes (Climate Change and Conflict in Uganda...). As temperatures rise, conflict in the Ankole corridor will only become more prevalent. Development, huge population increases, desertification because of overgrazing, and legal systems will only exacerbate already existing issues in the area. As you can see from the diagram external variables that begin with global warming eventually contribute to less rainfall. These first variables are positive in nature until we get to water scarcity which has a number of different effects. 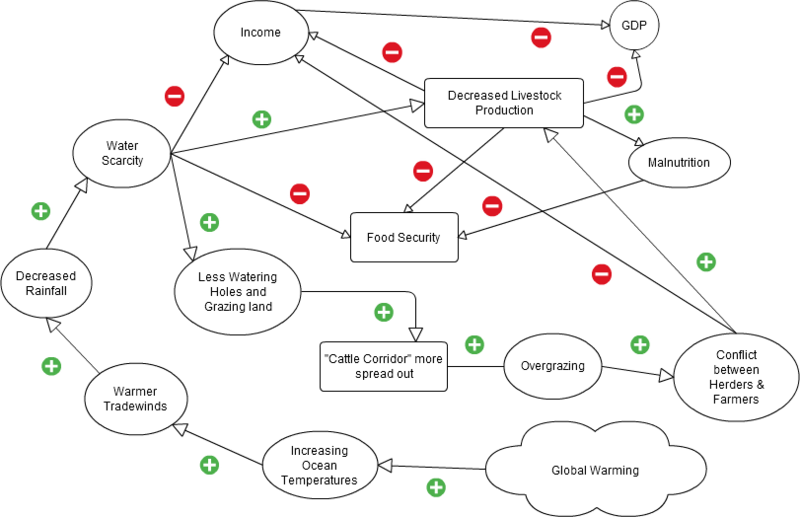 The lower arrow points to another positive flow of variables where we see the cattle corridor getting larger as herders travel further and further to feed their cattle. This in turn contributes to overgrazing and then conflict between herders as well as farmers which decreases income and increases a decrease in cattle production. With this in mind, we see that water scarcity also inversely affects income levels and food security while positively affecting the decreasing of cattle production. Decreased cattle production thus positively affects malnutrition while negatively affecting food security, income, and GDP. More conflict between herders and herders, and herders and farmers has negative impacts on many different levels. The strategic level of interest remains at the internal level. Conflict is occuring between domestic actors and is unlikely to escalate to an international level, but could have international implications if social order and food security is not maintained within Uganda's borders. Although this conflict remains internal, we see several international actors stepping in to aid in the reduction of conflict related causes and issues. This dispute is rather recent only becoming completely visible in 2004. The dispute could become worse, mirroring rising temperatures and more erratic rainfall patterns or it could subside with the onset of economic shifts, better land ownership implementation, and the installation of new technology for irrigation systems. Bifubyeka, Ebenezer. "Uganda: Cattle Corridor Hit By Harsh Climate Changes."allAfrica.com:Home. N.p., n.d. Web. 11 July 2011. <http://allafrica.com/stories/200908240297.html>. "Birdwatching holidays - Birding Tours - UGANDA. "Worldwide Birdwatching Holidays, Birding Holidays and Birding Tours. N.p., n.d. Web. 11 July 2011. <http://www.birdholidays.co.uk/birdwatching%20in%20uganda%202007.htm>. "Case Studies: Assessing the impacts of climate change in Uganda | 2nd United Nations WWDR 'Water, a shared responsibility'(2006)." United Nations Educational, Scientific and Cultural Organization. N.p., n.d. Web. 11 July 2011. <http://www.unesco.org/water/wwap/wwdr/wwdr2/case_studies/uganda/index.shtml>. "Climate - Uganda - annual, temperature." Encyclopedia of the Nations - Information about countries of the world, United Nations, and World Leaders. N.p., n.d. Web. 11 July 2011. 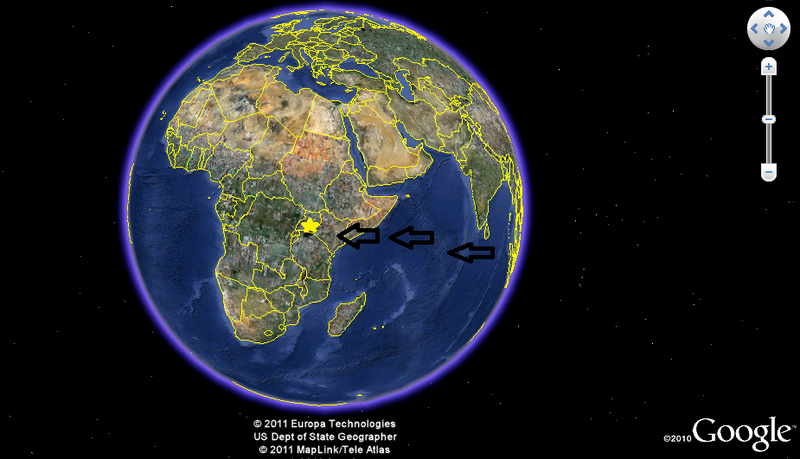 <http://www.nationsencyclopedia.com/Africa/Uganda-CLIMATE.html>. "Climate Change and Conflict in Uganda: The Cattle Corridor and Karmoja." USAID. N.p., n.d. Web. 11 July 2011. <www.fessglobal.org/Publications/Other/Climate_Change_and_Conflic_%20in_Uganda.pdf>. Corner, Adam. "Climate change in Uganda: “The biggest unreported story of our times” | Carbon Brief." Home | Carbon Brief. N.p., n.d. Web. 11 July 2011. <http://www.carbonbrief.org/blog/2011/03/hidden-heat-climate-change-in-uganda>. Deininger, Klaus, and Raffaella Castagnini. "Incidence and Impact of Land Conflict in Uganda." World Bank. N.p., n.d. Web. 11 July 2011. <elibrary.worldbank.org/docserver/download/3248.pdf?expires=1310357279&id=id&acname=guest&checksum=FEFB1E220CB264AB927BE2D44EE39829>. "Impact of Temperature Rise on Robusta Coffee in Uganda-Maps and Graphics at UNEP/GRID-Arendal." Maps and Graphics at UNEP/GRID-Arendal. N.p., n.d. Web. 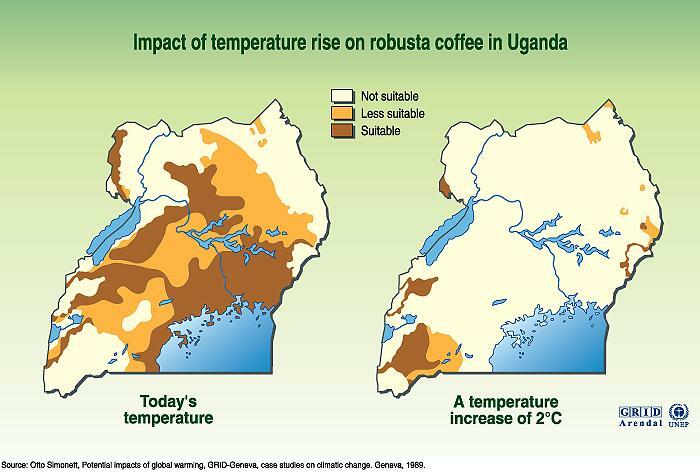 11 July 2011.<http://maps.grida.no/go/graphic/impact-of-temperature-rise-on-robustacoffee-in-uganda>. "International Water Management Institute(IWMI):Home Page." International Water Management Institute(IWMI): Home Page. N.p., n.d. Web. 11 July 2011. <http://www.iwmi.cgiar.org/>. "Livestock Development Project." Government of the Republic of Uganda. N.p., n.d. Web. 11 July 2011.<ftp://ftp.fao.org/docrep/fao/007/ae562e/ae562e00.pdf>. "Queen Elizabeth National Park, Uganda." Flickr. N.p., n.d. Web. 11 July 2011.<http://www.google.com/imgres?imgurl=http://farm6.static.flickr.com/5090/529238302195705d122.jpg&imgrefurl=http://www.flickr.com/photos/36524915%40N05/sets/7215624857227523/detail/&usg=__9zuEMxPO1tHV26gE27znVitv9Y=&h=288&w=500&sz=198&hl=en&start=0&zoom>. Reid, R.S., S. Serneels, M. Nyabenge, and J. Hanson. "Grassland of the world." FAO: FAO Home. N.p., n.d. Web. 11 July 2011. <http://www.fao.org/docrep/008/y8344e/y8344e06.htm>.